Bitumen-free, low-odour formulation which bonds to many substrates. 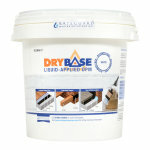 Safeguard Drybase Liquid-Applied DPM is a ready to use single-pack barrier coating which is applied in two coats. 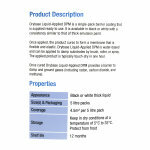 Product cures from a membrane that is elastic and flexible. Provides a barrier to damp and ground gases (including carbon dioxide, radon and methane). 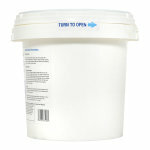 Water-based product that can be applied by brush, spray or roller to damp substrates, typically touch-dry in one hour. Coverage of 4.5sq/m per 5L pack. 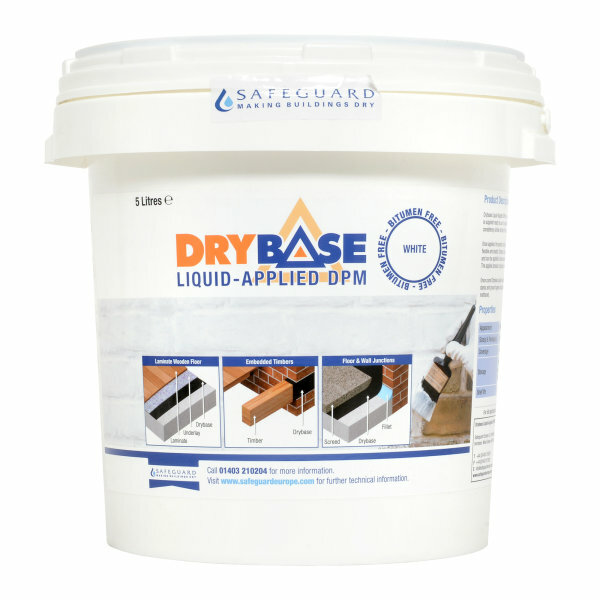 Drybase Liquid-Applied DPM is a single-pack barrier coating that is supplied ready to use. It is available in black or white with a consistency similar to that of thick emulsion paint. All contact surfaces must be sound, clean and smooth with a trowelled or brushed finish. Any masonry should be flush-pointed and defects in existing surfaces made good. Remove any laitance, dust, loose material or surface water. Apply at least two coats with each at 0.55 litres/m2 in order to comply with CP102:1973, Code of Practice for the Protection of Buildings against Water from the Ground. Always allow the first coat to become touch dry (typically one hour) before applying a second coat at right angles to the first. The first coat should not be allowed to dry for more than 24 hours before applying the second coat. Black Drybase will go on as dark blue, and dry to black once it's cured. If the colour remains blue, then this is an indication that further drying is required. Application of the membrane should not be undertaken if rain is expected before the coating can dry. 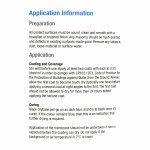 Do not apply if the background or air temperature is 7°C or lower.